Magnificent scenery with Lake Bachalpsee of blue night colour. 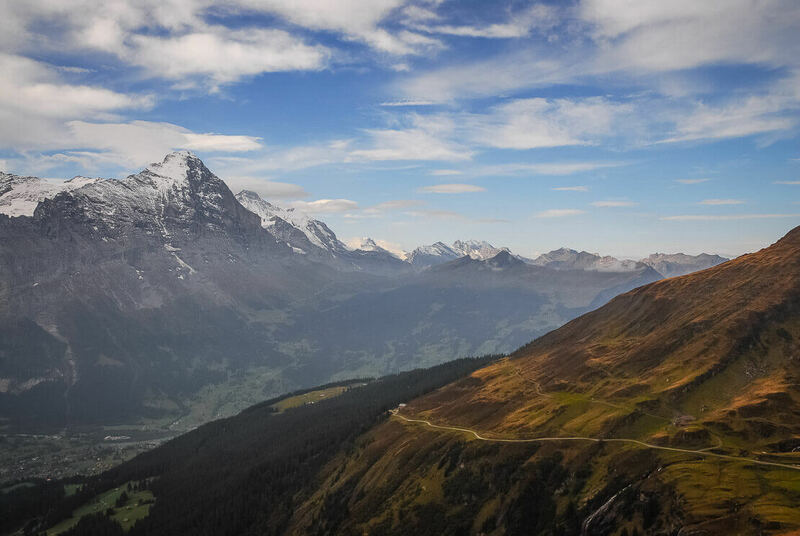 Chamois climbing the mountains and the mythical Berghotel Faulhorn with its 360° panoramic view of the peaks of the Berner Oberland – the hike in Grindelwald is spectacular! 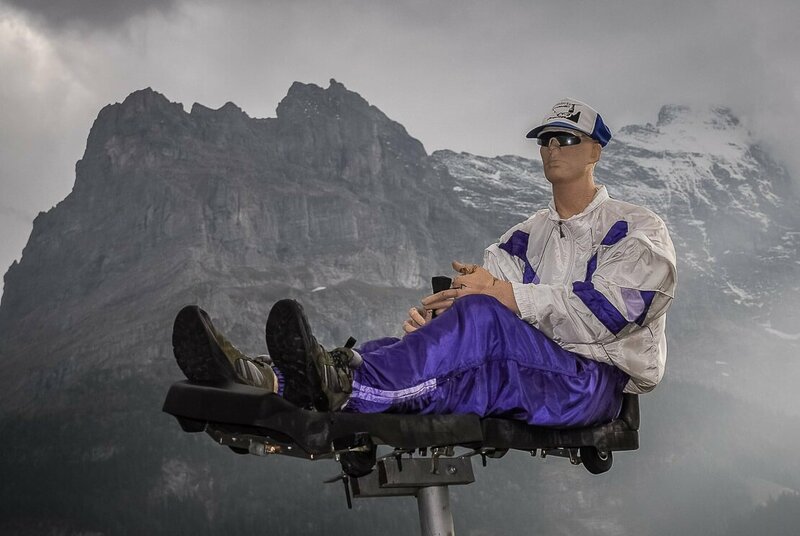 One day our friend from London decides to come to visit us in Switzerland. What are we going to show him? 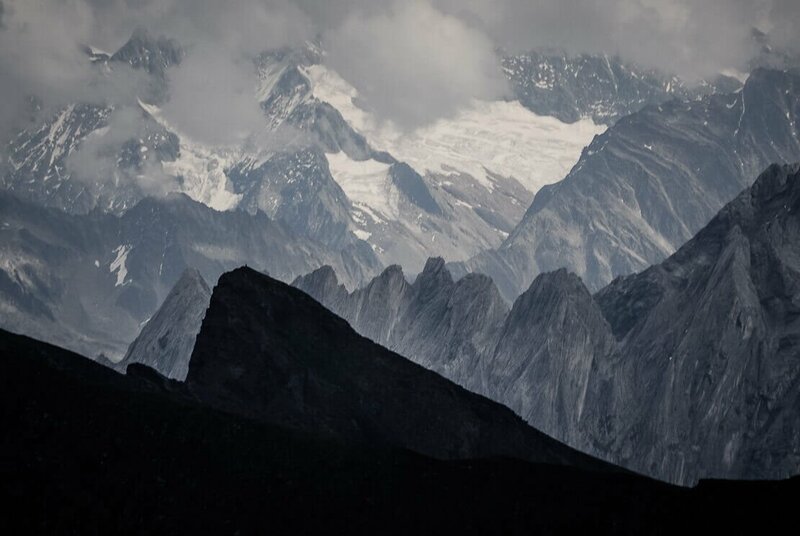 Mountains ! Except that he never went hiking in his life and he has no hiking equipment. 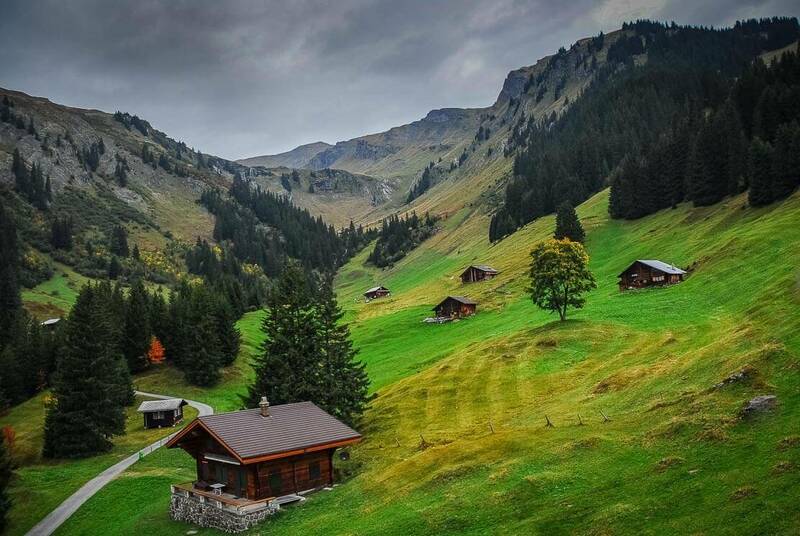 After having some thoughts, we decide to go to a typically Swiss place, with a beautiful landscape and very easy access – Grindelwald. 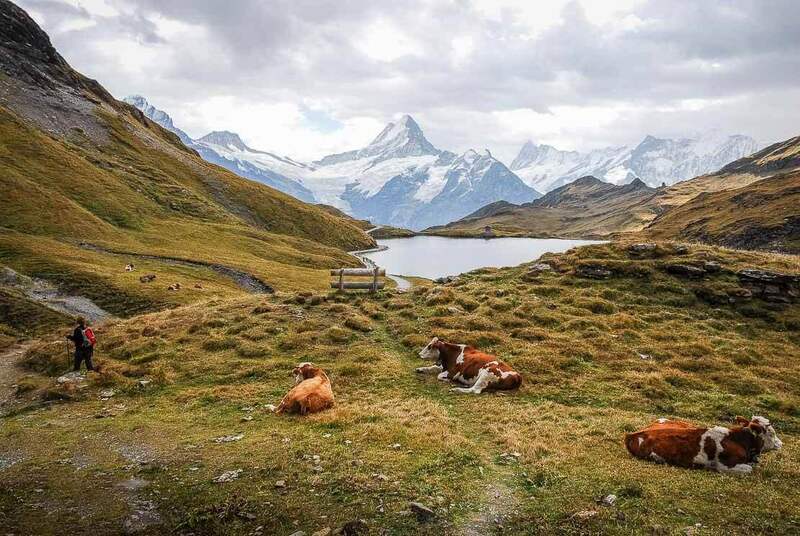 With its many possibilities for hiking, Grindelwald is a perfect place for an introduction to Swiss landscapes. 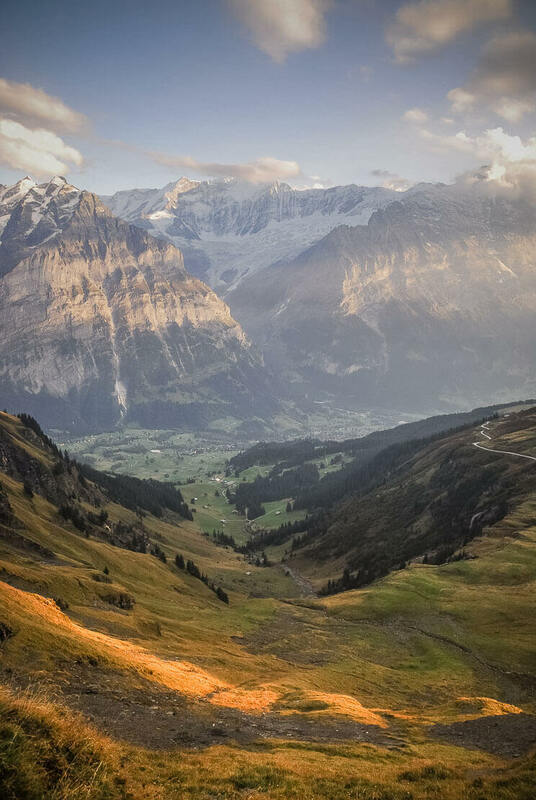 We leave Geneva early in the morning for our hike in Grindelwald. 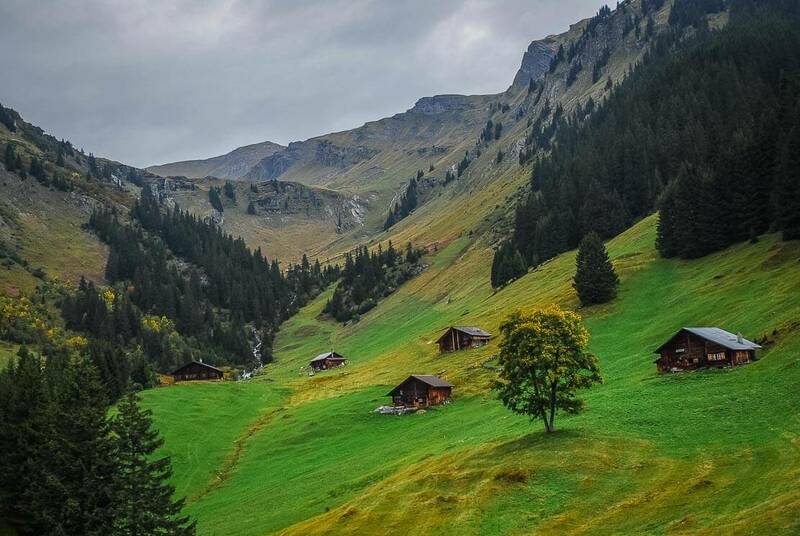 Located in a valley surrounded by snow-capped peaks such as Wetterhorn, Eiger, Mönch and Jungfrau, Grindelwald is a typical Swiss village in the Bernese Oberland. We wander around the village before taking a cable car to First. Once at First, we are impressed by the surrounding landscape. Just the view opening from First can justify the whole journey. 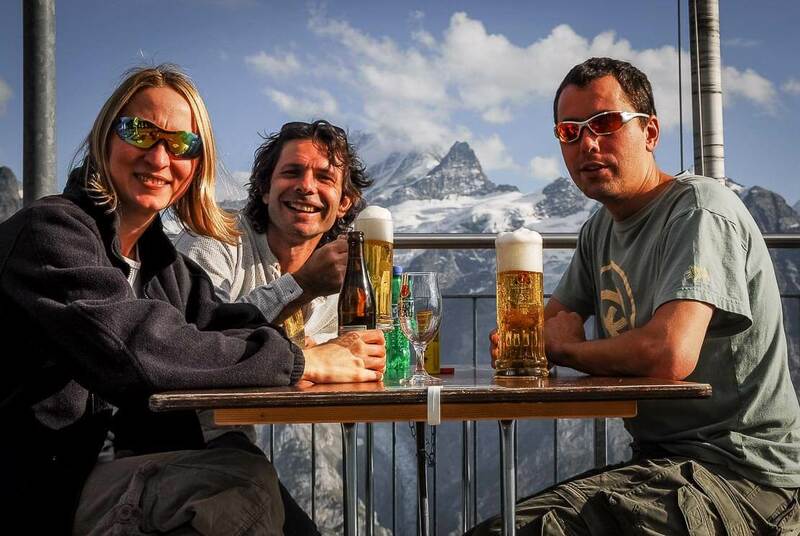 As the mountain hotel Berghotel Faulhorn is full (which is often the case), we stay at the Berggasthaus in First. 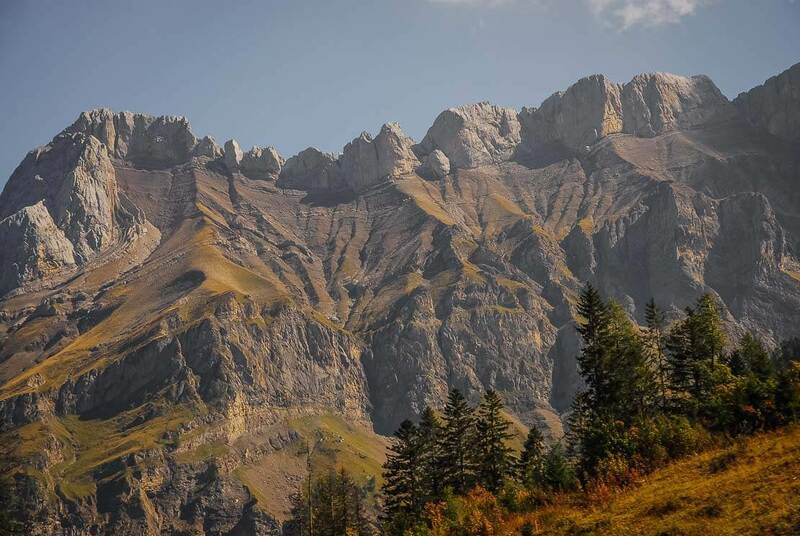 We leave our bags and start our little hike. 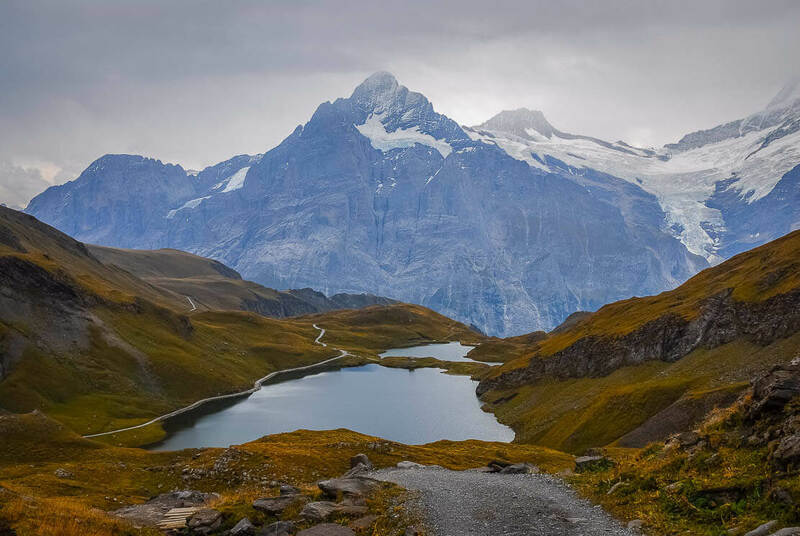 From First, we take a wide and well-kept hiking trail coming from the Grande Scheidegg, which takes us to the road to Faulhorn. 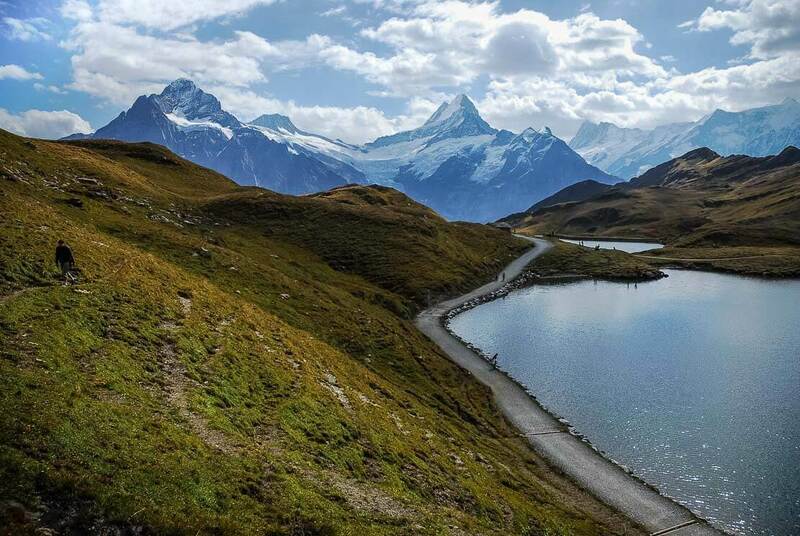 Following this trail we arrive to the Lake Bachalp, or Bachalpsee. 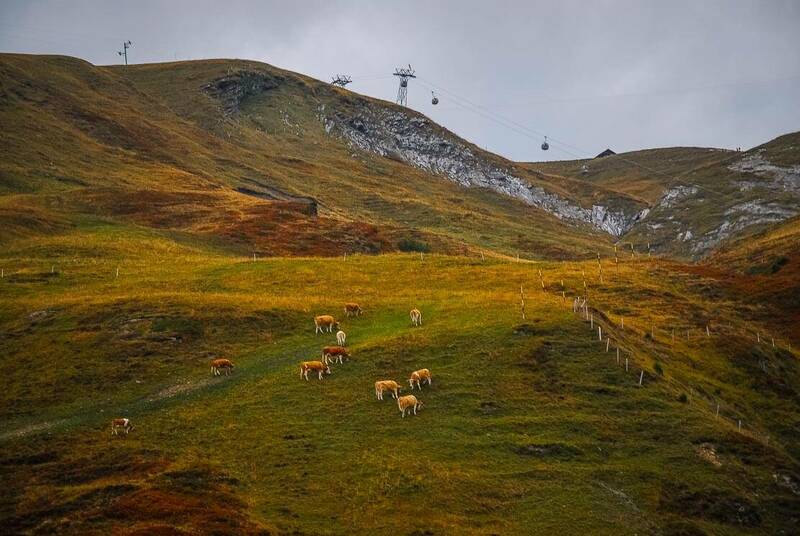 We are in autumn, and the alpine pastures are now yellow giving another aspect to the scenery we used to see here. The trail is very easy, and more or less flat. 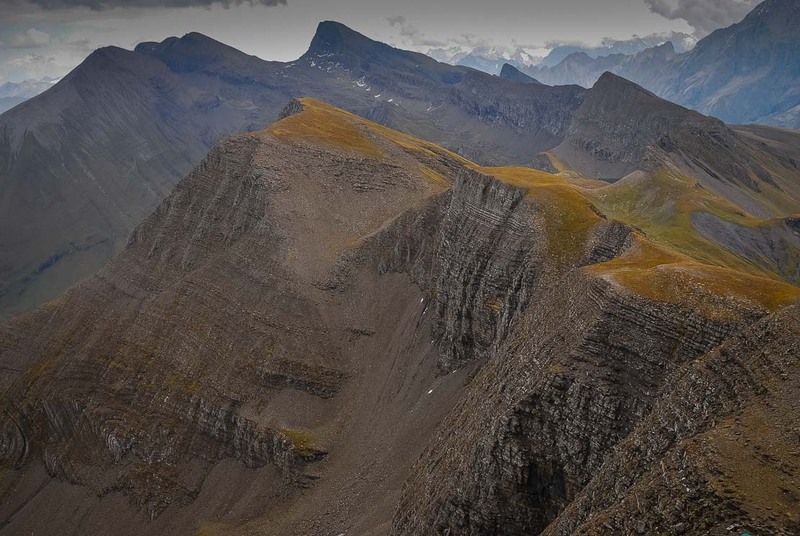 There is just a small ascent at the beginning of the walk. Our Londoner seems to be fit enough for this walk. We are at Bachalpsee of blue night colour. 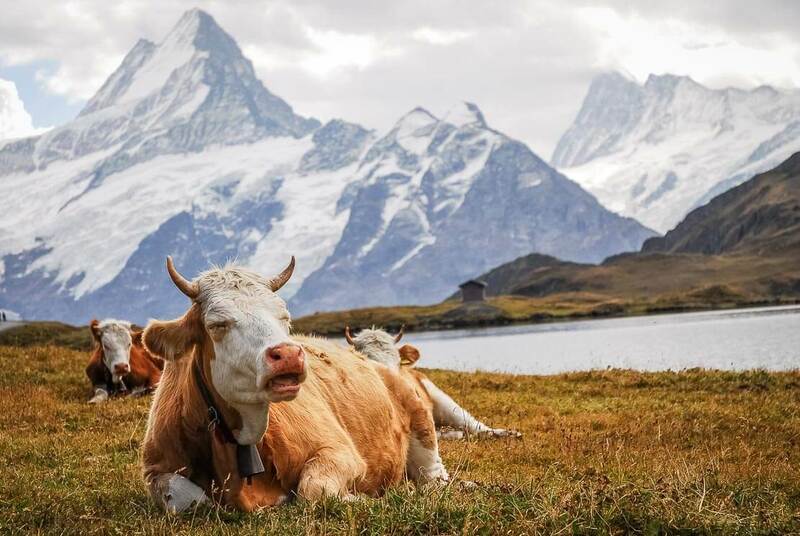 This beautiful mountain lake, located at 2,265m above sea level, seems to come straight out of a postcard, especially with yellow pastures as a background, a very beautiful contrast. 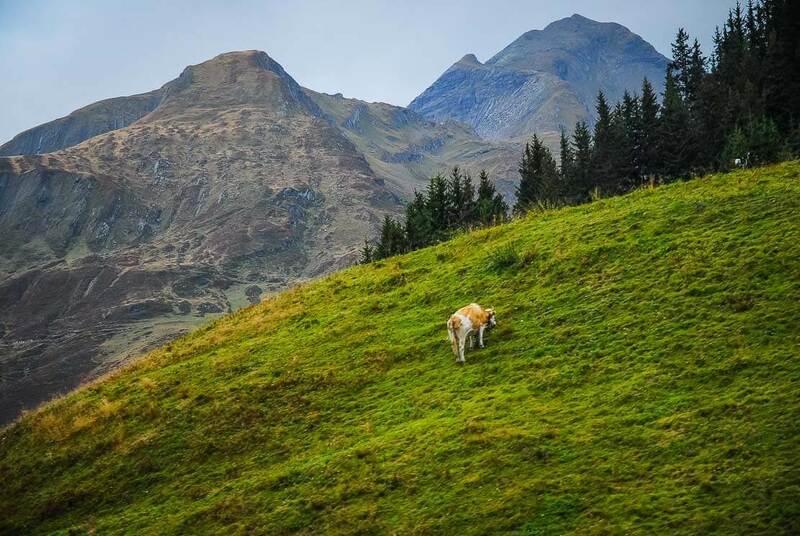 We come across the famous Simmental cows, with the bells on the neck that we still hear as we continue our walk. 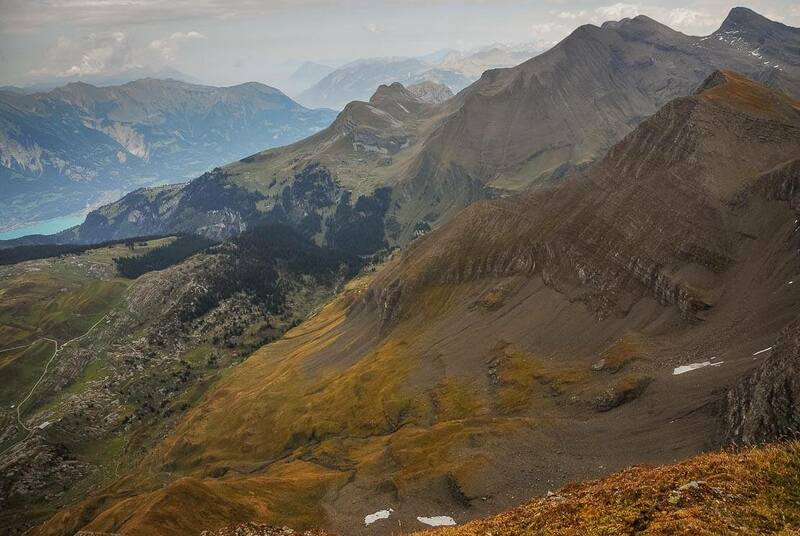 In the distance, we see a number of chamois climbing the mountains. 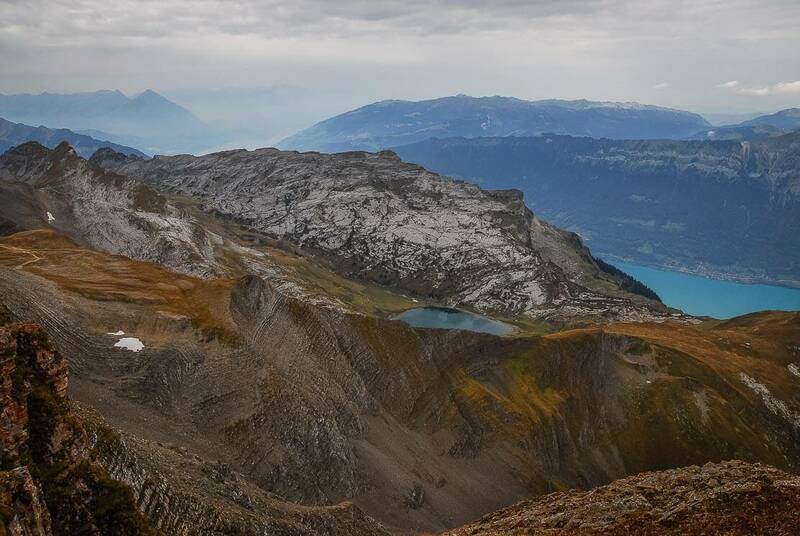 We find out that the Lake Bachalp, the most photographed lake in the Bernese Oberland, is an artificial lake used for producing electricity. 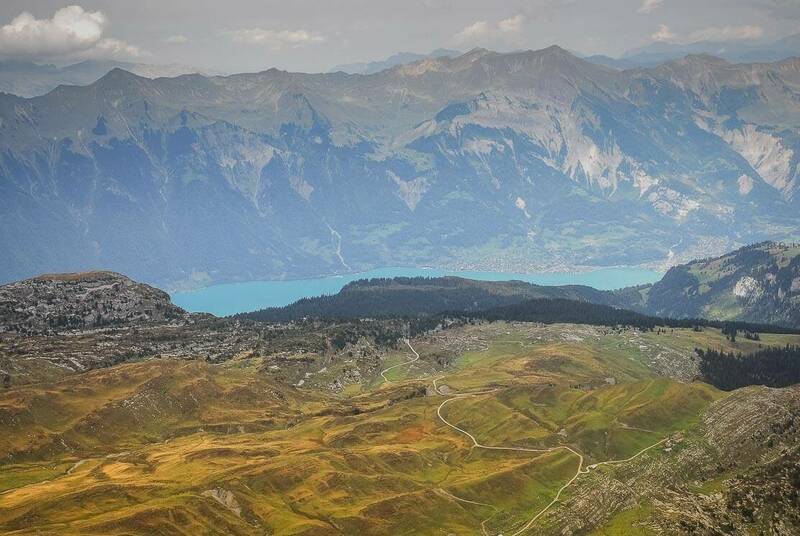 We stroll along the lake and enjoy the magnificent panorama of the Jungfrau peaks. 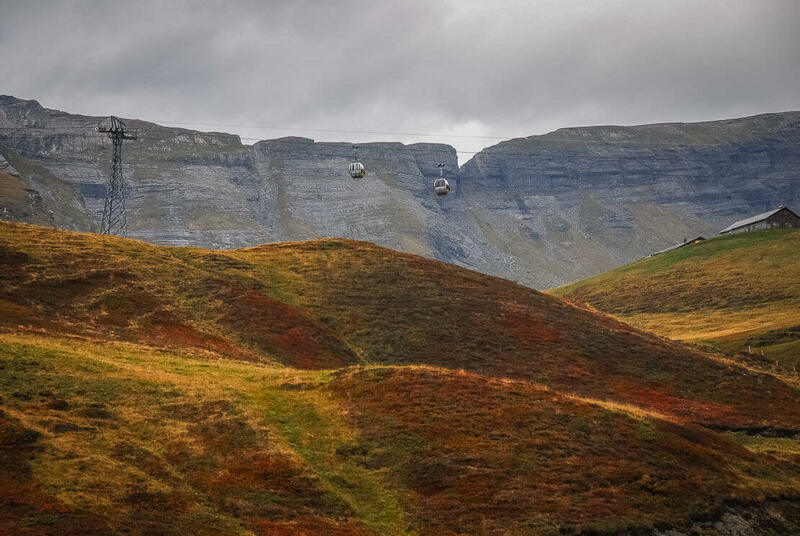 These snow-capped peaks are in sharp contrast with the autumnal colours. 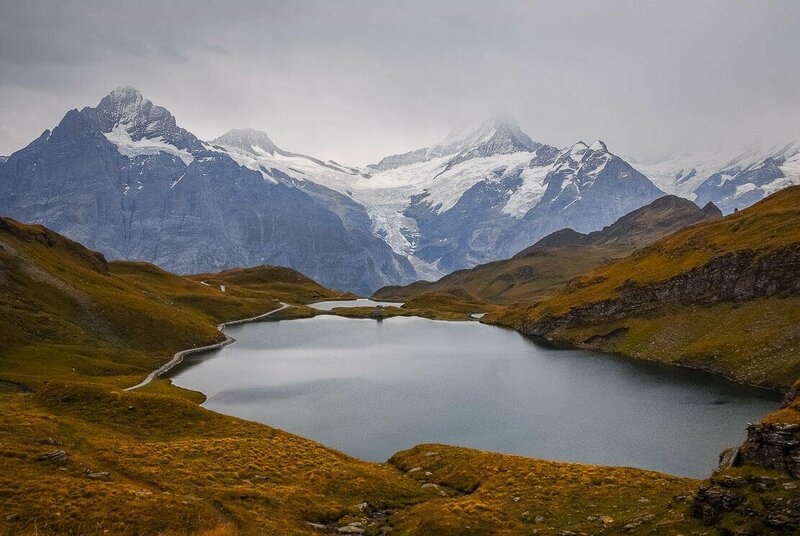 When the weather is good, without any wind, the Schreckhorn peak is reflected in the waters. But we don’t have that chance because of a small breeze that removes the reflections from the lake. 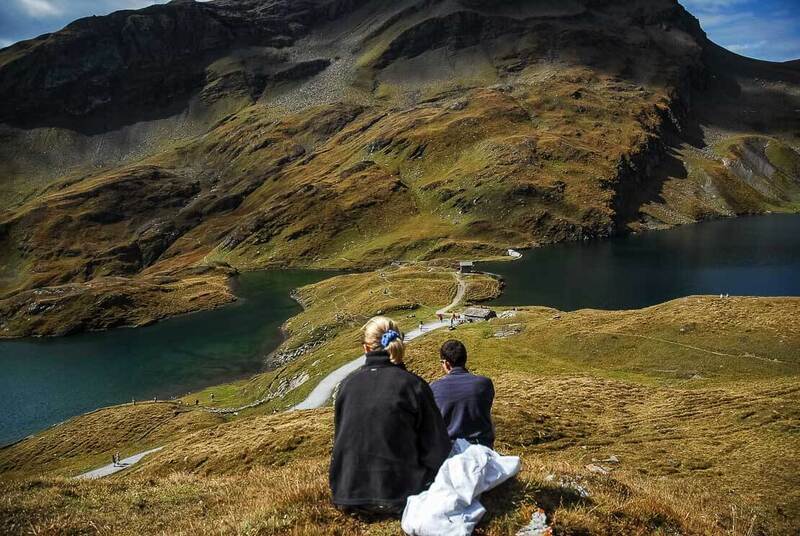 Bachalpsee, with its easy access, attracts many people. 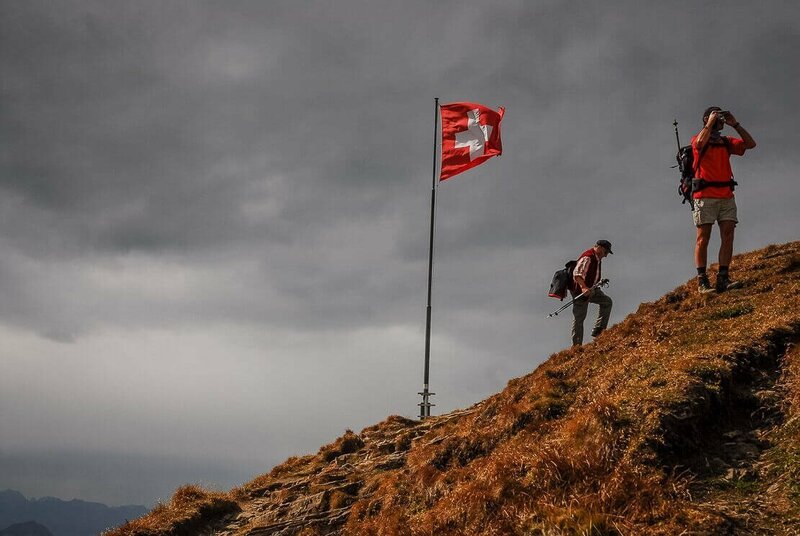 But we are lucky as we are in the middle of the week and at the end of the hiking season. There is hardly anyone! 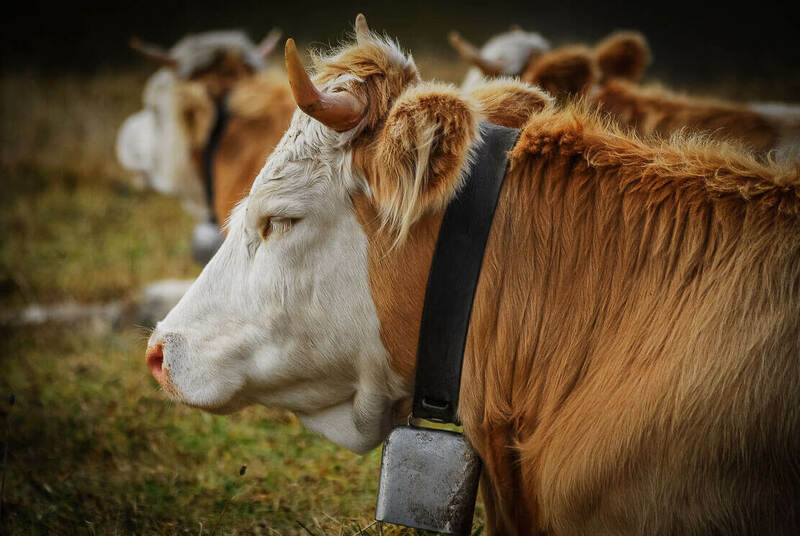 We continue our walk on the old track of muleteers, which begins to climb abruptly. 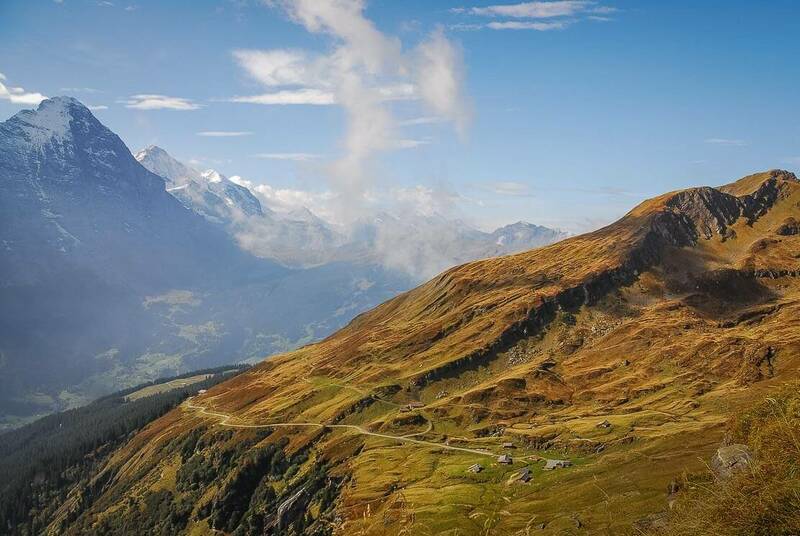 In the distance we can see the famous historic mountain hotel, the Berghotel Faulhorn, which lies on top of the hill, after a few bends. 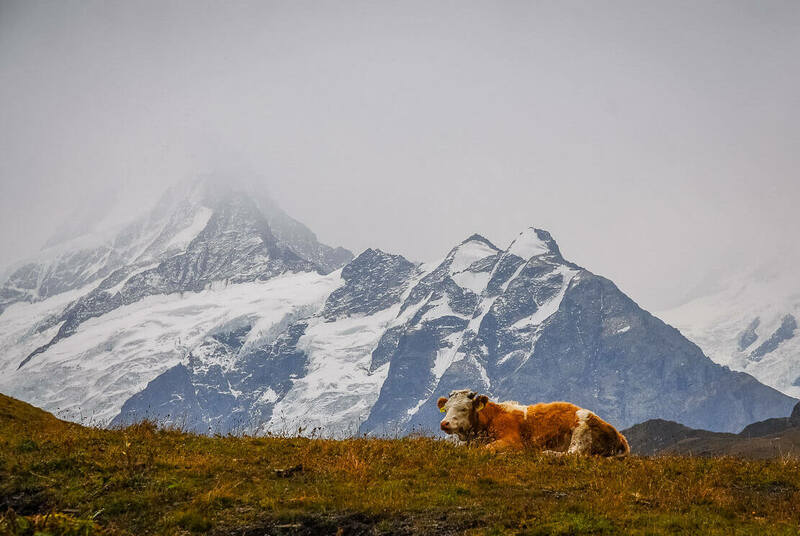 The Berghotel Faulhorn is a mythical place in Switzerland. 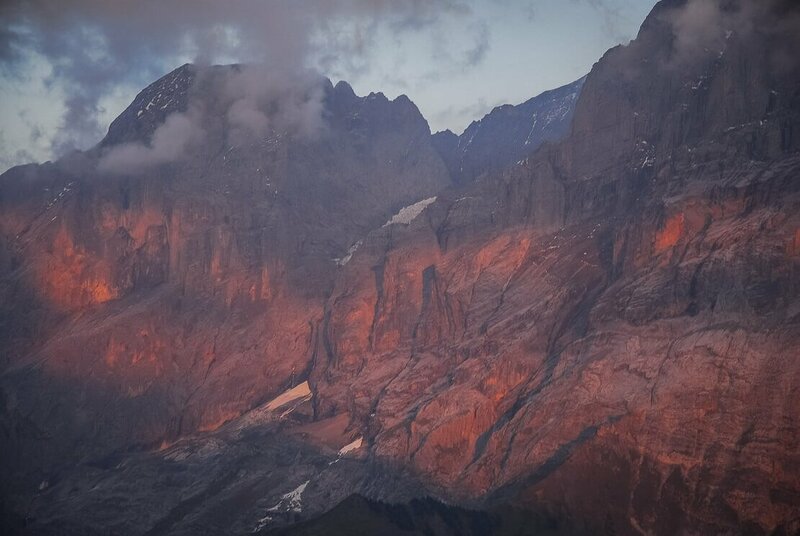 In the beginning it was a lodge dating back to 1823, the highest one in the Alps at this time. The building has been constructed in its current form in 1830, and the hotel opened its doors in 1832. It was a real technological challenge and a big achievement to build such a structure in altitude at that time. 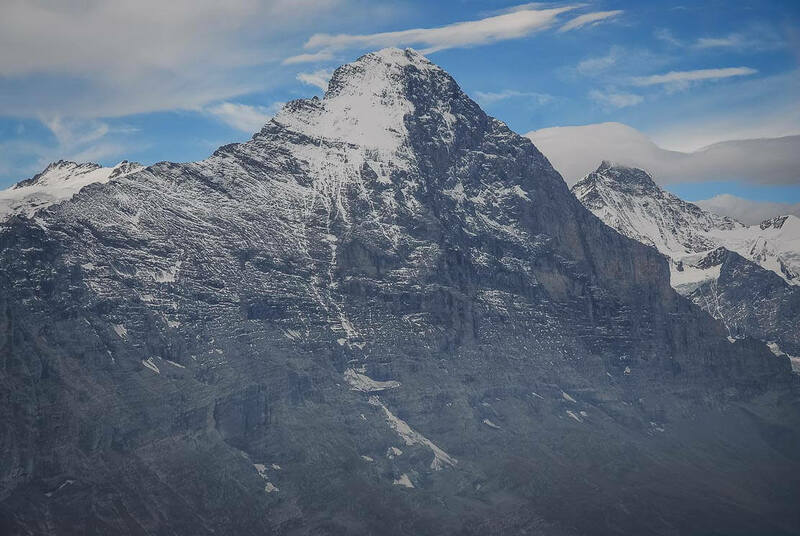 Perched on top of Faulhorn at 2,681m above sea level, Berghotel Faulhorn dominates the valley. We are happy to get there and have a cold beer after our efforts! 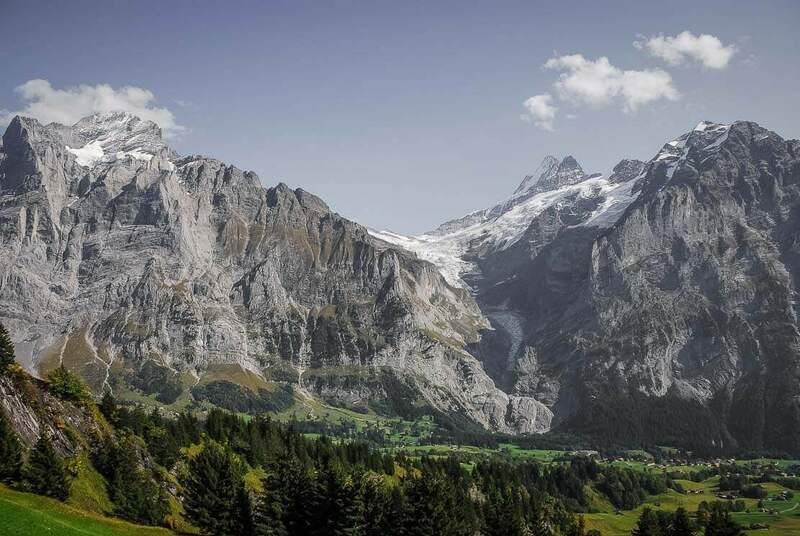 From the terrace we have an impressive 360° view of all the famous peaks of the Bernese Oberland (the Eiger, the Mönch and the Jungfrau), the seven lakes and a view of half of Switzerland. 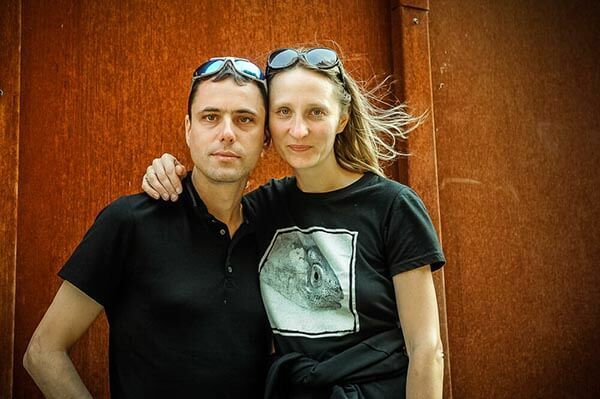 We enjoy the panorama until the last moment. It starts to be late and it’s time to go back. 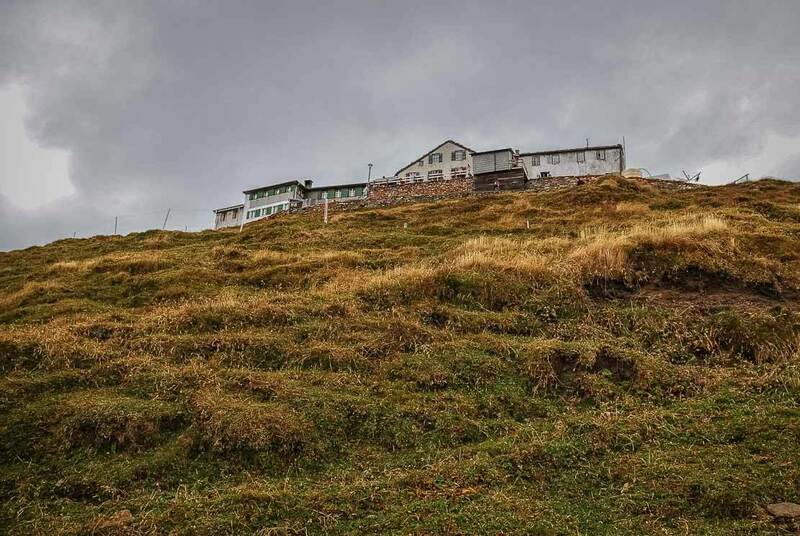 We start our descent to First where we will spend a night at the Mountain Lodge First located at 2’167m. 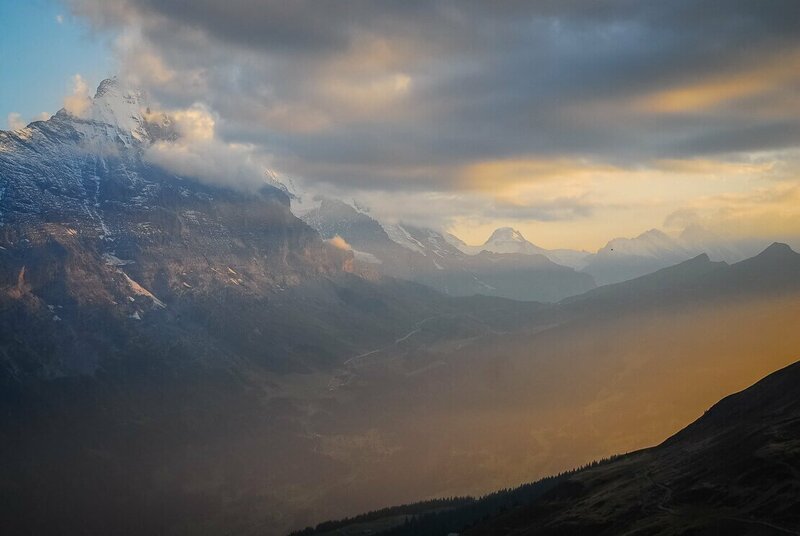 The mountain lodge First is located in a beautiful setting with a panoramic view of the Eiger, the Mönch and the Jungfrau. 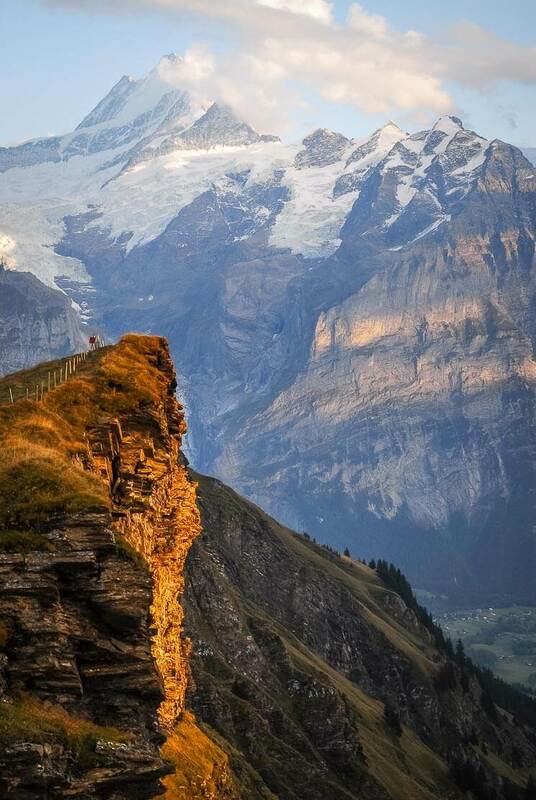 The impressive Schreckhorn peak overlooks the village of Grindelwald. We take our seats on the terrace for dinner, despite the chilly air outside and the falling night. The stars are glistening and the moon is throwing a soft light on the magnificent mountains. 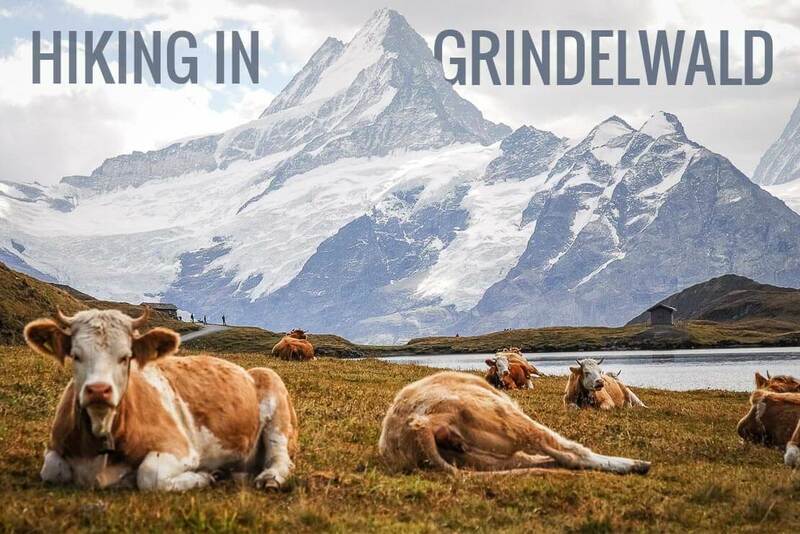 The next day we go back to Grindelwald. 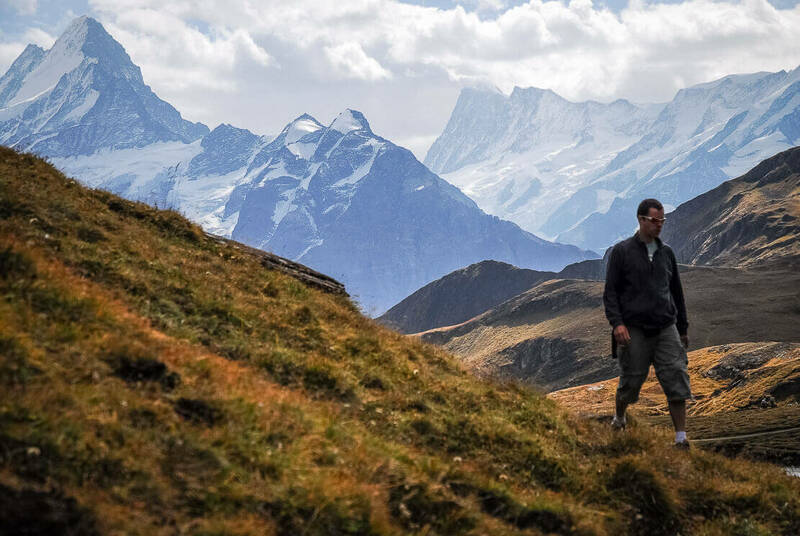 We leave for Geneva with very fond memories of this hike in Grindelwald! 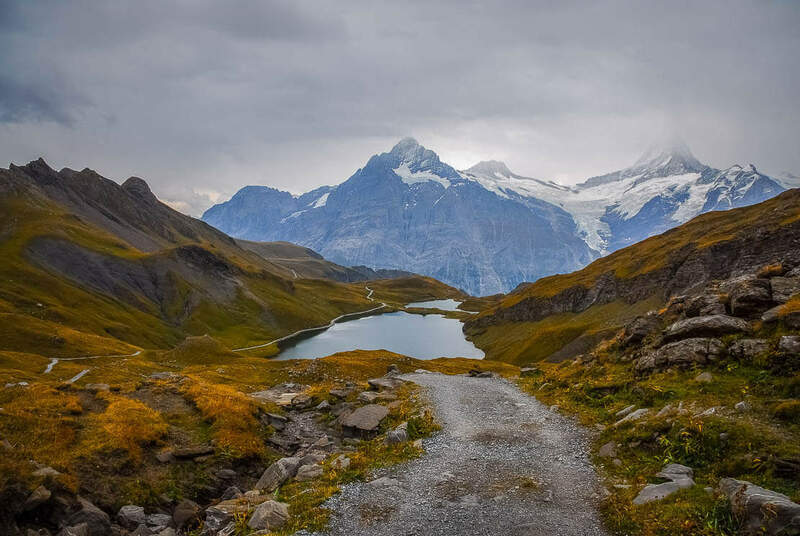 Access: The hike to Grindelwald (Grindelwald – First – Bachalpsee – Berghotel Faulhorn – First) is in the Bernese Oberland region of Switzerland. 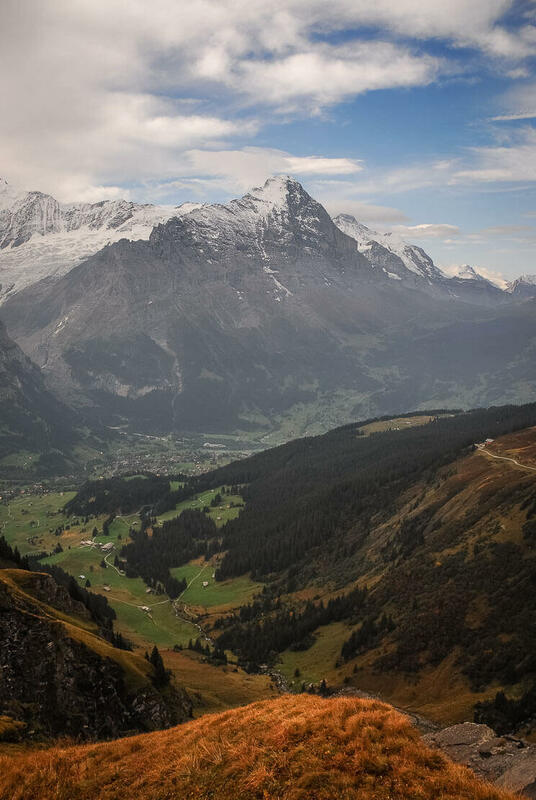 The mountain hotel Berghotel Faulhorn and the mountain lodge First (Berggasthaus First) are accessible by cable car from the village of Grindelwald. 1. 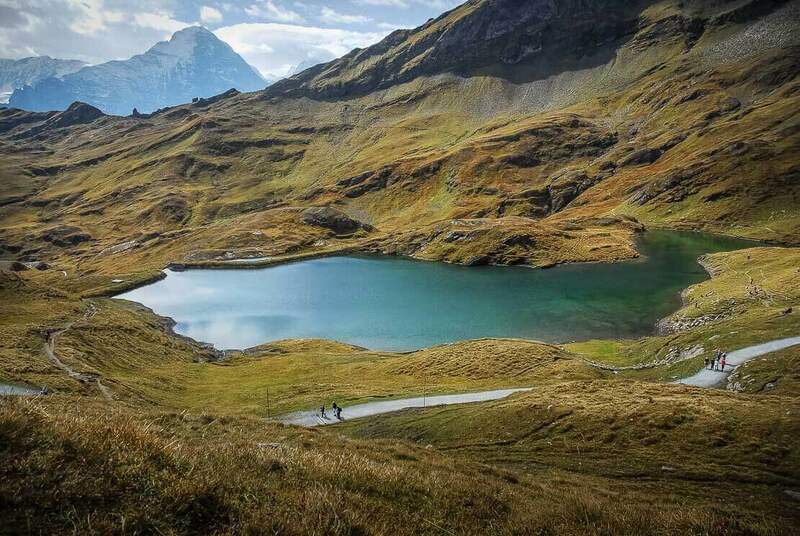 Continue the hike from Bachalpsee to Bussalp via Faulhorn. Additional walking time: 3h +. 2. 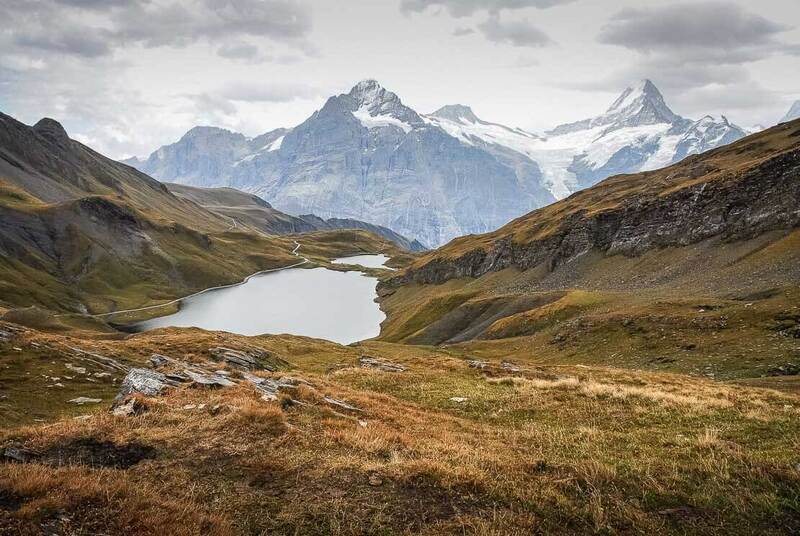 Continue hiking from Bachalpsee to Bussalp via Hireleni and Feld. Additional walking time: 3 hours. 3. 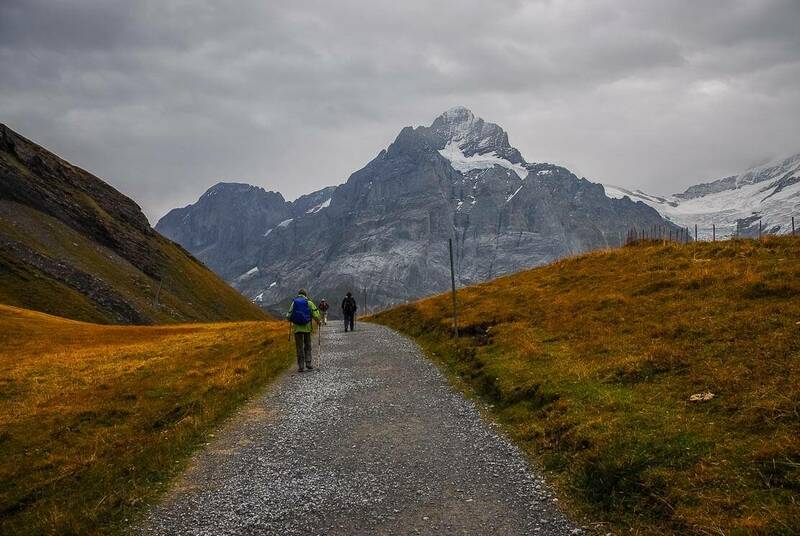 Continue the hike from Bachalpsee to Bort. Additional walking time: 1h30. 4. 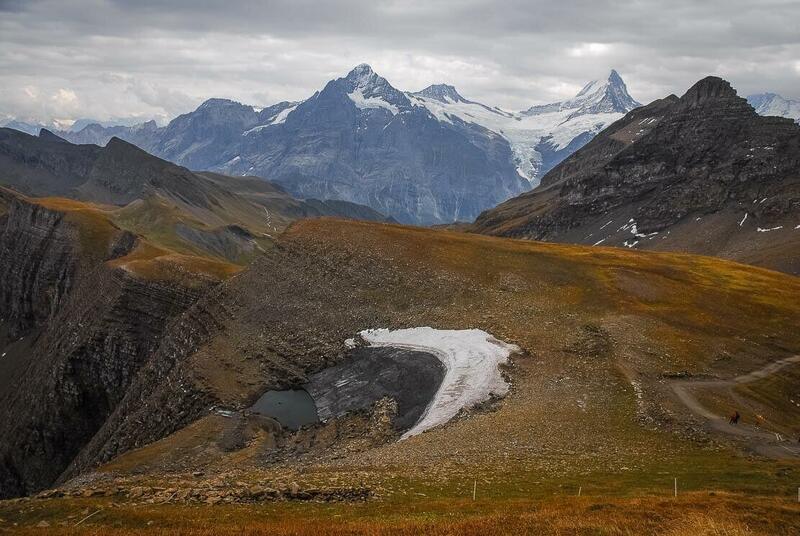 Continue hiking from Bachalpsee to Grosse Scheidegg. Additional walking time: 4 hours. 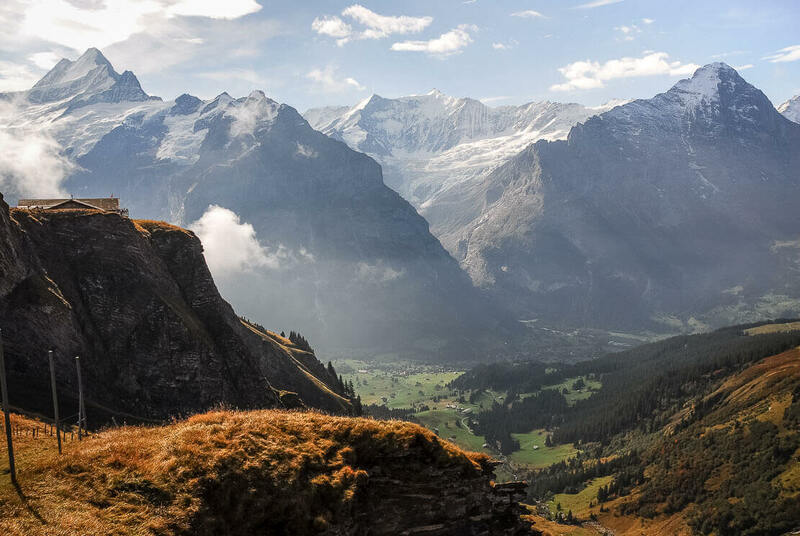 There are many hiking trails in the area: Grosse Scheidegg, Kleine Scheidegg, Männlichen, First, Bussalp and Pfingstegg. 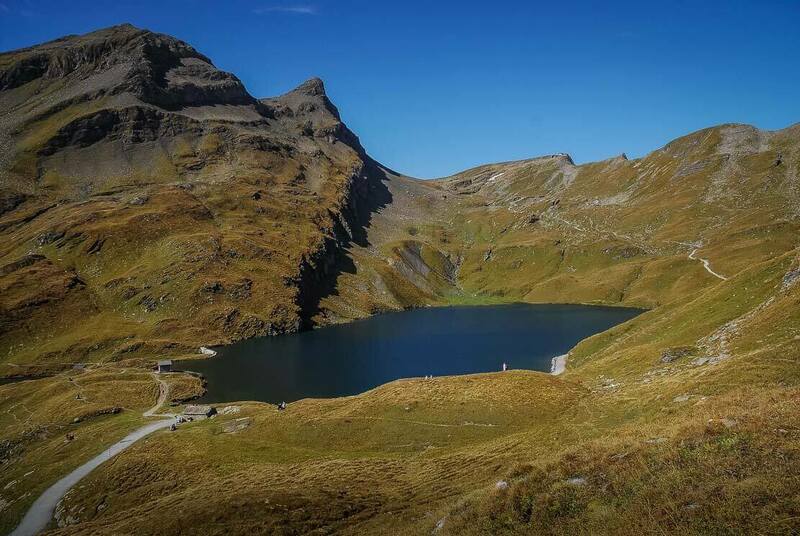 Hiking First – Bachalpsee is 3km, about 2 hours, with 148m altitude difference. Very easy hike: T1 (easy hiking). 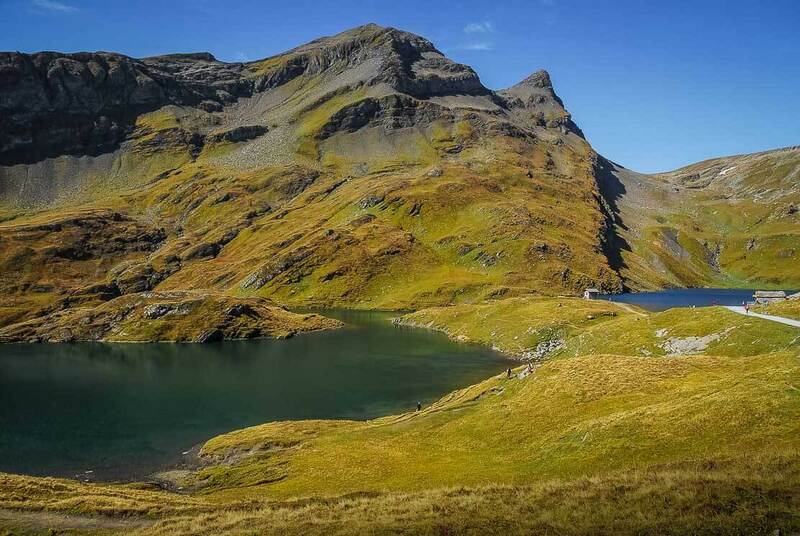 If you decide to continue and to hike First – Faulhorn – Bussalp, this hike is 9.5km, 3h-4h, with 538m altitude difference. 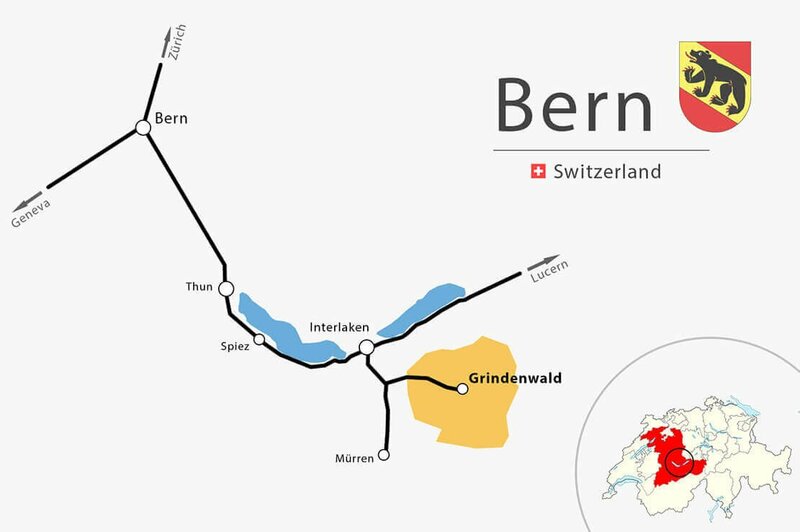 Berghotel Faulhorn is accessible by train from Wilderswil to Schynige Platte (4h walk) or by cable car from Grindelwald to First (2h30 walk). 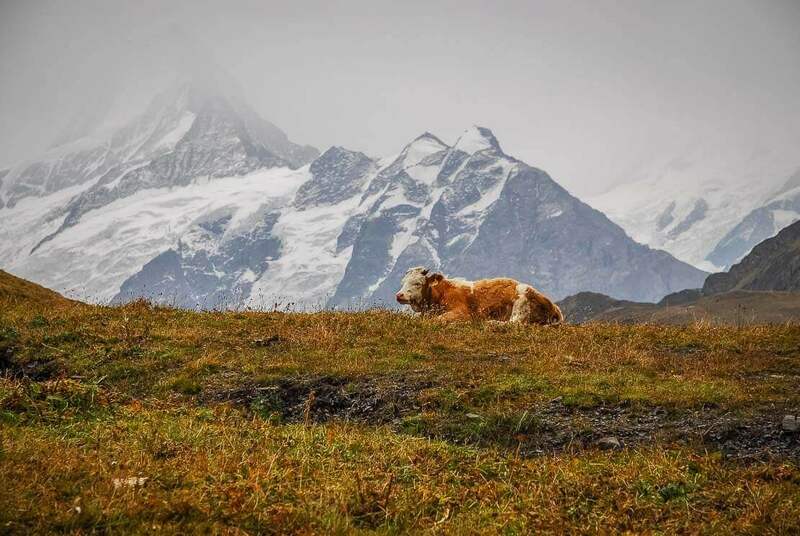 Berghotel Faulhorn offers individual rooms and dormitories. Two blankets per person are provided. Bringing linen is recommended. Reservations required. 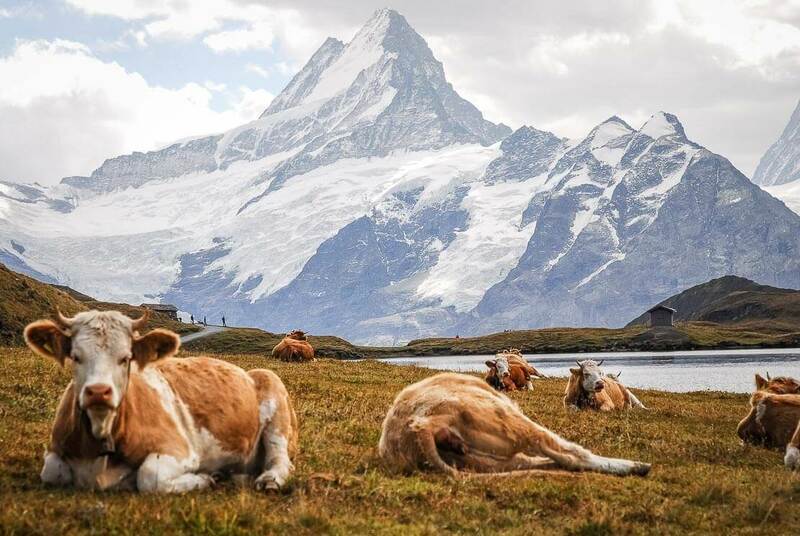 Berghotel Faulhorn is often full in summer. Half-board or à la carte menu are available depending on the number of visitors. 2. 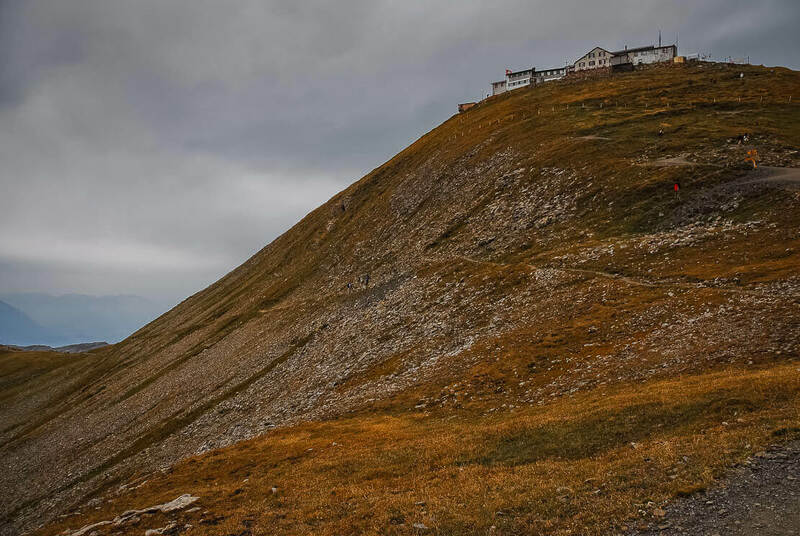 Mountain lodge First (Berggasthaus First) is located at 2,167m above sea level website (in German only). 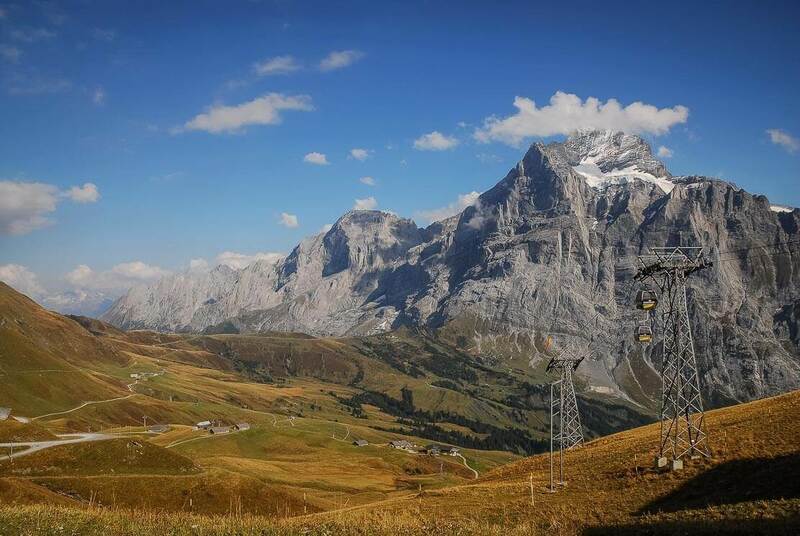 Berggasthaus First is accessible from Grindelwald by cable car. It’s located in the same building as the cable car station First. Berggasthaus First offers dormitories with half-board. 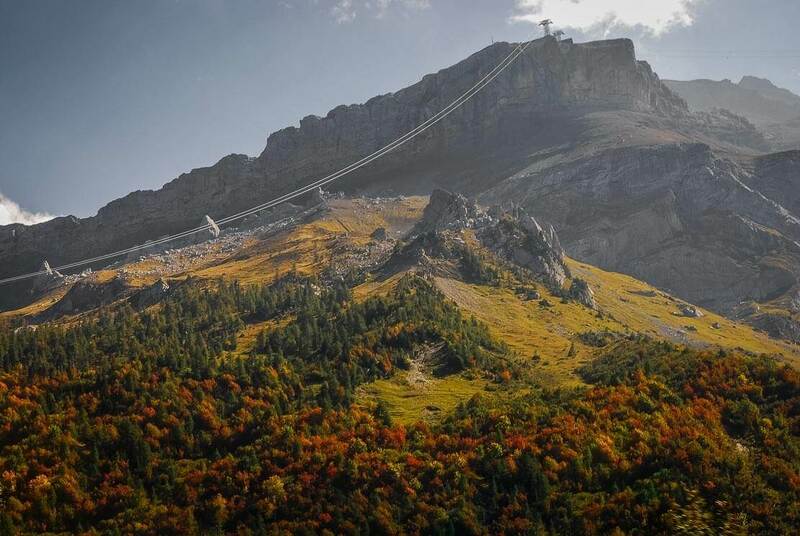 It also offers a direct access to the ski slopes in winter. Reservations required. Berggasthaus First is often full.